Sails – Sailrite Kit | Canadian SeaSpray Assn. After working on your boat, probably a new suit of sails will be your biggest expense in trying to gain performance. A good understanding of how your sails are made, draft considerations (either full or flat); proper care of, and material considerations will help you to get the most value from the money you spend. There are various books you can read on the subject. You can also discuss the topic with fellow knowledgeable sailors as well. I found that a company that can help you make sails has reasonably easy to understand books available to help explain how sails are made. The company is ‘Sailrite’ and you can access them on the internet. After gaining an understanding about sails you should be able to discuss with your sail maker what you would like to incorporate in your new racing sails. With computer programs and computer aided cutting of panels, shape can be programmed as you like it. You can refer to the class rules concerning the sail dimensions. These are available from the association or the website. The choice of material for a racing sail is important as suitable material will be less prone to bias stretch. Firmer material will have a low bias stretch compared to a softer material. Firmer material will also hold built in shape better especially if you use side stay adjusters while sailing downwind in less windy conditions. Racing Dacron material will also be smoother and so cause less drag. Laminate sails using mono-film with yarn sandwiched between the layers in a pattern the same as typical Dacron sails but also with an X pattern resist bias stretch almost completely. The laminates are being upgraded and changed quickly when new and better materials are found. Draft considerations for the Seaspray sails have tended towards fuller sails as opposed to the flatter sails on higher aspect rigs on bigger catamarans. Suggested by some that camber ratios for Seaspray sails be in the 1/10 range (1foot of draft for every 10 feet of chord) is contrary to the 1/15 camber ratios (flatter) suggested for higher aspect catamaran sails. Flatter sails on high aspect rigs go to windward better but fuller sails go downwind better. This is why asymmetrical downwind spinnakers are popular on larger cats with high aspect rigs carrying flat sails. 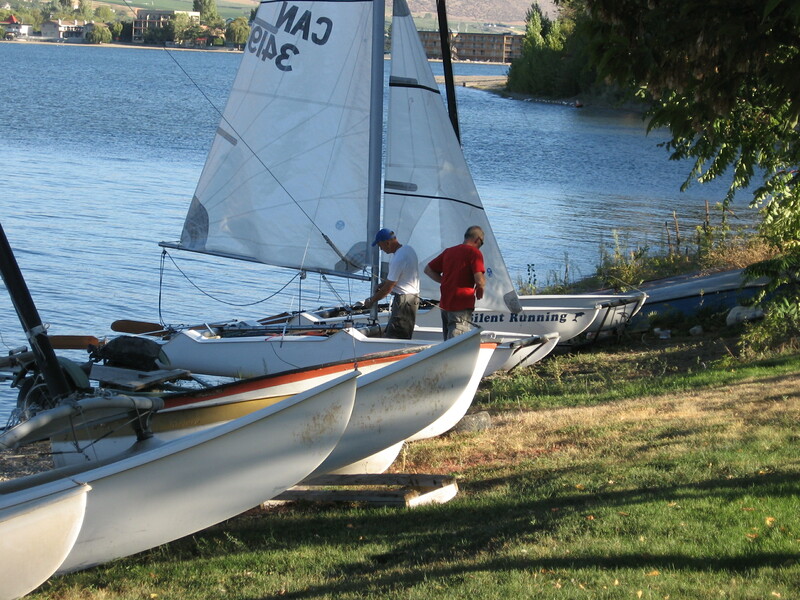 Care of racing sails require that you roll them to prevent creases forming. Another important care item is to not let sails flog while the boat is sitting on the beach. It is relatively easy to lay the boat on it’s side and or roll the jibsail around the luff wire as it tends to flog more than the mainsail. Racing sails will cost a little bit more due to the increased material cost but will reward you with better performance. We haven’t seen any new racing halyard suits in a lot of years compared to new sock suits. Hopefully some of the halyard sailors will invest in new racing sails for their boats. Windows in your jib sail help prevent collisions. When sailing your boat consider the best location for a window and discuss this with your sail maker. I feel the window was not placed in the best location on my racing set which was produced about 5 years ago. I have heard similar comments from others who have had racing sails produced lately. Look at older halyard sails for a suitable location for a window. Radial cut sails need a little more thought on the best panel to use as a window.